Spinzwin Casino will then reward you with a bonus (Welcome Bonus is for new players only). 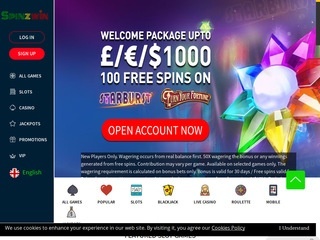 The terms and conditions of the bonuses vary between different casinos and might also change over time and between different countries, so it is important to compare the different offers and read the T&C for Spinzwin Casino before signing up. It’s understandable that sometimes you may be a bit wary before signing up to a new casino. Is it legit? Will you be paid out if you win the jackpot? Are there security measures in place? Well, thankfully Spinzwin Casino, established in 2017, answers yes to all those questions. Operated by ProgressPlay Limited, the casino already has a glowing reputation, and many years of experience in the industry. A colourful, yet simple site, broadcasts a wide selection of games, and attentive customer service ensures you’ll never be short of help. New players will also be able to take advantage of a huge 100% welcome bonus on up to £200, plus 25 free spins. Take a read of our review and get ready to Spinzwin! Even though Spinzwin Casino hasn’t got the biggest list of software developers we have ever seen, there is a strong focus on quality. They work alongside some of the best companies in the world, including NetEnt, Microgaming, ELK Studios, and NextGen Gaming. There’s also the inclusion of some smaller developers too which allows for a diverse game selection. 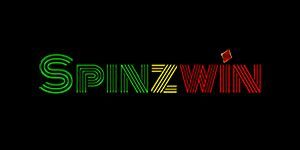 There are over 400 slots available at Spinzwin Casino so you really will be spoilt for choice. Gamers will find a satisfying amount of 5-reel games, and all the popular hits are here. These include Starburst, Gonzo’s Quest, Thunderstruck 2, Game of Thrones, and Spinata Grande. The jackpot game selection isn’t the largest, but there’s still seven to choose from. These will give you the best chance of winning a huge amount of money, and they include King Cashalot, Treasure Nile, Fruit Fiesta, and Tunza Munni. If slots aren’t your thing, then you can try your luck at some of the table games at Spinzwin. There’s a decent amount of traditional titles, including roulette, blackjack, and baccarat. However, we could not find any poker games. There are also some other interesting games at the casino, such as Odd One and Six Shooter. NetEnt and Extreme Live Gaming are the providers for Spinzwin’s live casino games. In total there are 14 available, including roulette, blackjack, and baccarat. If you want to play the games for real money at Spinzwin then you will have to make a deposit. Thankfully, this is a straightforward process, with banking methods available such as Visa, MasterCard, Maestro, Pay By Phone, Sofort, Neteller, Skrill, Paysafecard, Trustly, and iDeal. All deposits are made instantly, and the minimum limit is £10. In terms of withdrawals, the minimum is £20, £30 or £50 depending on the method. The largest amount that you can withdraw per week is £3,000, while the maximum per month is £6,000. Currencies accepted include Great British Pounds, US Dollars, Euros, and Kroner. Spinzwin goes to great lengths to ensure that customers are well looked after in terms of support. Try heading over to the FAQ section on the site which is loaded with lots of useful information that may answer your query. If you need to speak to a customer support agent, then you can do so by emailing the casino or using the online chat feature. Both of these methods are available 24/7 so you’ll never find yourself short of help. Unfortunately, there was no telephone number that we could find. However, if you’re handy with social media, you will be able to follow the casino on Facebook, Twitter, Google +, Instagram, and YouTube. You can even directly message an agent directly from your account if you wish.